The Ontario government passed legislation to create Family Day in 2007. The first Family Day was observed on Feb. 18, 2008. There are over 330 provincial parks in Ontario, Canada, with more than 100 providing visitor facilities. 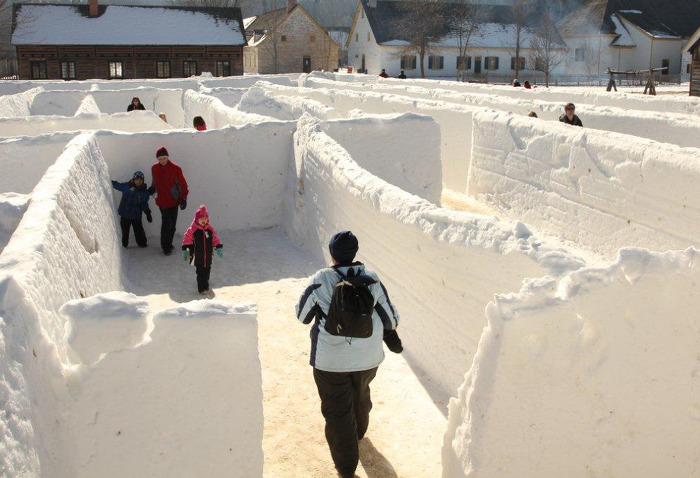 “Get lost in the giant snow maze, one of many seasonal activities in store for families at the annual Voyageur Winter Carnival at Fort William Historical Park.” Photo: Ministry of Natural Resources, Ontario, Canada. Lace up your skates and glide around the skating trails at MacGregor Point and Arrowhead provincial parks. Visit the animals at the Children’s Farm at Bronte Creek Provincial Park. Check out Winter in the Wild in Algonquin Provincial Park for guided walks and talks, skating, marshmallow roasting and winter camping demonstrations. Join a wintery walk at Presqu’ile Provincial Park with bird watching, animal tracking and the possibility of ice volcanoes! Marvel at the beauty of Killarney Provincial Park in winter and check out guest speakers and star-gazing at the park observatory. Enjoy folk music performances, storytelling and art at the Exploring Newfoundland Art exhibit at the McMichael Canadian Art Gallery. Be amazed by bizarre plants that eat their prey and meet animals with wild defense strategies that help to keep them alive at the Savage Gardens, Nature’s Ninjas exhibits at the Royal Botanical Gardens. Stay warm in a snow fort or sugar shack at the Fort William Historical Park winter carnival. Celebrate heritage week in Ontario from Feb. 17- 23 at participating museums and heritage sites that are open on Family Day across the province. The Ontario government and seven partners have launched the Ontario Children’s Outdoor Charter: download an activity passport to track progress in completing 12 outdoor activities. 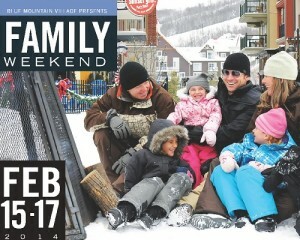 Plan more winter adventures with your family during the upcoming March break, from March 10-14. Gather the family for a weekend of active adventure and entertainment. Skate under the stars, watch birds of prey fly overhead, tour the Village by Horse & Wagon and enjoy their Fireworks display! Please click here for the complete schedule of activities and events. Family Day schedules for outdoor rinks and select indoor rinks vary and are available at http://www.toronto.ca/skate or by calling 311. There is no charge for public skating at the City’s indoor or outdoor rinks. Supervised shinny hockey is available FREE of charge for various ages and skill levels. Family Day schedules for each city facility are available at http://www.toronto.ca/parks/prd/skating/dropin/hockey/index.htm or by calling 311. Some programs are gender specific. CSA-approved hockey helmets are mandatory; full face masks are mandatory for participants under the age of 18. Neck and mouth guards are strongly recommended, along with other protective equipment. Participants must have their own gloves and stick. The farm is open daily from 9 a.m. to 5 p.m. Families are invited to visit the cows, horses, sheep, goats, rabbits and farm cats. The farm is located at 201 Winchester St. and will offer indoor board games, sewing crafts with the Cabbagetown Quilters Guild and activities with the Toronto Guild of Spinners and Weavers. On Family Day drop-in activities run from 10 a.m. to 3 p.m. and are FREE. More information is available at http://www.toronto.ca/parks/zoo/ or by calling 311. The Shared Path, the newest of the City’s Discovery Walks, includes 15 km of trails through a series of park areas along the banks of the Humber River. More information is available at http://www.toronto.ca/parks/trails/discover.htm. The Discovery Walks program is 10 self-guided walks linking ravines, parks and neighbourhoods to showcase Toronto’s outstanding natural features and cultural and historical attractions. Maps are available at http://www.toronto.ca/parks/trails/discover.htm . Visitors can explore everything paper and pop-up at this one-room schoolhouse in North York. From Victorian times to modern day, see how paper and imagination can transform and delight. Everything paper includes silhouettes, paper-cut-outs, pop-up books, optical toys and paper dolls. Special guest Foldit Creations will lead origami lessons. Children can make a pop-up card to take home. Open from 10:30 a.m. to 4:30 p.m.
From Saturday through to Family Day, families can go on a scavenger hunt, try a craft, sample baked goodies and hot chocolate. Open from noon to 4 p.m. The City of Toronto operates 10 historic museums. More information is available at http://www.toronto.ca/museum-events or you can follow the museums at http://www.facebook.com/historictoronto and on Twitter @TOhistoricsites. The Bloor-Danforth line will be closed from Warden to Kennedy stations from Saturday, February 15 to Monday, February 17 for scheduled track construction. Shuttle buses will operate between Warden and Kennedy stations with staff on hand to offer assistance. Customers requiring an accessible connection must exit at Victoria Park or Kennedy stations, where a Wheel-Trans vehicle will be available. Regular subway service will resume on Tuesday, February 18 at 6 a.m. The TTC will be operating its holiday schedule on Monday, February 17. The holiday schedule has the same operating times as on a Sunday, with an earlier start time of 6 a.m.
Any routes that do not normally operate on a Sunday will not operate on February 17. More information is available at http://www.ttc.ca/Routes/General_Information/Service_Details.jsp. The City of Toronto encourages residents to enjoy Family Day on Monday, February 17 by taking advantage of a wide array of recreational activities, museums and other attractions. Family Day schedules for outdoor rinks and select indoor rinks vary and are available at http://www.toronto.ca/skate or by calling 311. There is no charge for public skating at the City’s indoor or outdoor rinks. CSA-approved hockey helmets are mandatory for children under the age of six, and are recommended for skaters of all ages. Supervised shinny hockey is available free of charge for various ages and skill levels. Family Day schedules for each city facility are available at http://www.toronto.ca/parks/prd/skating/dropin/hockey/index.htm or by calling 311. Some programs are gender specific. CSA-approved hockey helmets are mandatory; full face masks are mandatory for participants under the age of 18. Neck and mouth guards are strongly recommended, along with other protective equipment. Participants must have their own gloves and stick. Centennial Ski and Snowboard Centre, located at 256 Centennial Park Rd., will be open from 9 a.m. to 9:30 p.m. Earl Bales Ski and Snowboard Centre, located at 4169 Bathurst St., will be open from 10 a.m. to 9:30 p.m. Rental equipment and lift passes are available for purchase. Families can take advantage of the “Adults Pay, Kids Play” offer from 4 to 9:30 p.m. Adults pay $24 each and up to two children under 18 years of age can ski or snowboard for free (rentals not included). The use of a recognized ski or snowboard helmet is required for lessons and strongly recommended for other participants. More information is available at http://www.toronto.ca/parks/skiing or by calling 311. Make a splash at one of 10 City-run indoor pools open from 2 to 5 p.m. on February 17. Regular admission fees will apply: adult $2; child, youth and seniors $1 each; families $5.50. A list of locations is available at http://www.toronto.ca/parks/swimming. The farm is open daily from 9 a.m. to 5 p.m. Families are invited to visit the cows, horses, sheep, goats, rabbits and farm cats. The farm is located at 201 Winchester St. and will offer indoor board games, sewing crafts with the Cabbagetown Quilters Guild and activities with the Toronto Guild of Spinners and Weavers. On Family Day drop-in activities run from 10 a.m. to 3 p.m. and are free. More information is available at http://www.toronto.ca/parks/zoo/ or by calling 311. Toronto’s oldest zoo is celebrating 120 years. Located on Deer Pen Rd., the High Park Zoo offers both domestic and exotic animals including bison, llamas, peacocks, reindeer, highland cattle and sheep. The zoo is open daily year round from 7 a.m. to dusk. More information is available at http://www.toronto.ca/parks/zoo/ or by calling 311. The Shared Path, the newest of the City’s Discovery Walks, includes 15 km of trails through a series of park areas along the banks of the Humber River. More information is available at http://www.toronto.ca/parks/trails/discover.htm. The Discovery Walks program is 10 self-guided walks linking ravines, parks and neighbourhoods to showcase Toronto’s outstanding natural features and cultural and historical attractions. Maps are available at http://www.toronto.ca/parks/trails/discover.htm. Explore the history of Toronto and Fort York. Visit the Fort’s historic kitchen and sample baking from the hearth. Hot chocolate and a roaring fire will make this a memorable visit. Kids can participate in an 1812 drill class, officers’ sword drill and some old-fashioned games. Admission for adults is $7.96, seniors $3.81, youth $4.87, and children $3.76 (plus taxes). Free admission for children five and under. Open from 11 a.m. to 4 p.m. Visitors can explore everything paper and pop-up at this one-room schoolhouse in North York. From Victorian times to modern day, see how paper and imagination can transform and delight. Everything paper includes silhouettes, paper-cut-outs, pop-up books, optical toys and paper dolls. Special guest Foldit Creations will lead origami lessons. Children can make a pop-up card to take home. Open from 10:30 a.m. to 4:30 p.m. Free admission; donations accepted. In celebration of Black History Month, visitors will learn about the early black community in Toronto. Visitors can take home an important piece of journalism history by printing a copy of Mary Ann Shadd Cary’s newspaper, The Provincial Freeman. Children can try illumination (colouring previously drawn and printed pictures), which was a popular practice in the 19th century. Admission for adults is $6.19, seniors and youth $3.54, children $2.65 (plus taxes). Free admission for children four and under. Open from noon to 5 p.m.
Maureen’s Reel Irish Dancing will teach a dance workshop and Irish ceilidh from 2 to 3:30 p.m. Resident storyteller Nan Brien will share tales at 1:30 and 3 p.m. Cooks in the historic kitchen will prepare tasty treats over the fire. Admission for adults is $5.71, seniors and youth $2.86, children $1.90 (plus taxes). Open from 1 to 5 p.m.
From Saturday through to Family Day, families can go on a scavenger hunt, try a craft, sample baked goodies and hot chocolate. Admission is pay what you can. Open from noon to 4 p.m. Visitors can experience the privileged world of the Austin children and the working-class lives of the chauffeur’s children who lived at Spadina House. Families can participate in games, school lessons and more. Tours take place at 12:15, 1, 1:45, 2:30, 3:15 and 4 p.m. Admission for adults is $7.96, seniors and youth $5.75, children $4.87 (plus taxes). Free admission for children five and under. Open from noon to 5 p.m. Families can learn about owls, explore 19th century historic homes, sample tasty treats prepared on the open hearth and make owl-themed crafts. Admission for adults is $5.31, seniors and youth $3, children $2 (plus taxes). Open from noon to 4 p.m. The City of Toronto operates 10 historic museums. More information is available at http://www.toronto.ca/museum-events or you can follow the museums at http://www.facebook.com/historictoronto and on Twitter @TOhistoricsites. City of Toronto-operated Child Care Centres and Children’s Services’ district offices are closed. Toronto Home Child Care Agency providers will offer service as usual. All Toronto Public Libraries will be closed. Some community recreation centres will be closed on Family Day. Closure notices have been circulated in advance at those locations and will be posted at each site. Residents should call their local centre ahead of time to confirm if they will be open. All City of Toronto emergency and 24-hour services will operate normally. The Toronto Zoo will be open as usual from 9:30 a.m. to 4:30 p.m. on February 17. More information about activities at the zoo is available at http://www.torontozoo.com. The TTC will be operating its holiday schedule on Monday, February 17. The holiday schedule has the same operating times as on a Sunday, with an earlier start time of 6 a.m. Any routes that do not normally operate on a Sunday will not operate on February 17. More information is available at http://www.ttc.ca/Routes/General_Information/Service_Details.jsp. The Bloor-Danforth line will be closed from Warden to Kennedy stations from Saturday, February 15 to Monday, February 17 for scheduled track construction. Shuttle buses will operate between Warden and Kennedy stations with staff on hand to offer assistance. Customers requiring an accessible connection must exit at Victoria Park or Kennedy stations, where a Wheel-Trans vehicle will be available. Regular subway service will resume on Tuesday, February 18 at 6 a.m. More information is available at http://www.ttc.ca.